Bed and Breakfast in Waterkloof is situated in the upmarket residential area of Waterkloof in Pretoria, Bed & Breakfast in Waterkloof offers comfortable self catering accommodation. Breakfast can be arranged on request. 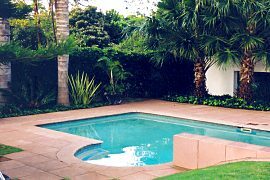 Bed & Breakfast in Waterkloof is situated in the upmarket suburb of Waterkloof. Conveniently close to Brooklyn Mall, cinema theatres, restaurants, University of Pretoria, UNISA, Little Company of Mary Hospital, SABS, Virgin Active, Gauteng North Tennis Association, Loftus and Pretoria Country Club. The two private luxurious units offer accommodation for the single person, a couple or a family of four. Each flat has a bedroom with a king size bed, a bathroom with a bath as well as a shower, a fully equipped kitchenette with a hob, microwave and fridge which allows for self-catering. Included is also a dining room and lounge which has the usual facilities as well as two extra single beds and a television. Fax and modem facilities are available. Swimming pool and safe parking on the premises. Laundry service and easy access to major highways.